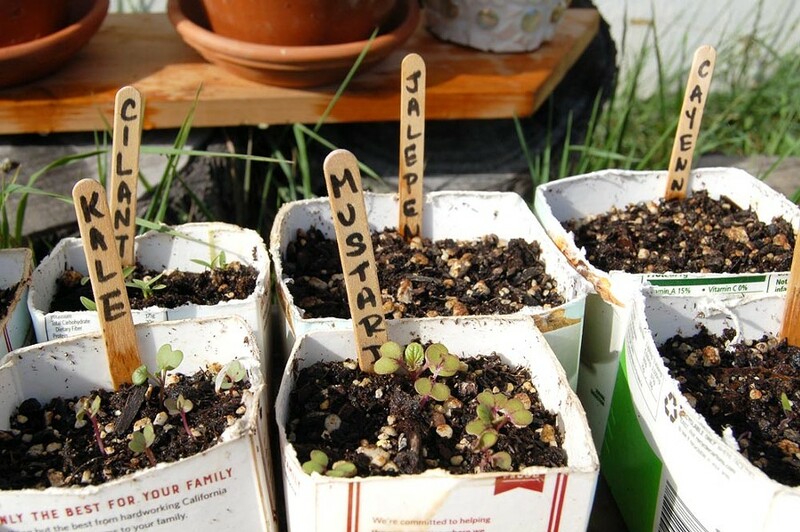 Photo by Katie Rose McGourty The beginnings of a victory garden in recycled milk cartons. What does gardening have to do with being more environmentally friendly? Whether you're a seasoned gardener or just beginning, I'm here to encourage everyone to start or expand their edible landscaping this year. Maybe it will come as a decision of economics or to fulfill as desire to live more lightly on the planet. Maybe it means growing basil on the windowsill or filling raised beds with every vegetable imaginable. In celebration of Mother Earth, there are many ways to lighten our steps using home food production as a tool of sustainability. We can look to the victory gardening movement as proof that home food production can become a significant supplier of food. During World War II, the victory garden movement began as a campaign to conserve food for our soldiers overseas. With seeds and a planting schedule, America grew its own food right at home. In one year, home food production met commercial levels. So why not go back to our roots? Yes, it is wonderful to have beautiful organic produce available for purchase at several grocery stores and farmers markets. Isn't it just more convenient to buy everything we eat? But what if we decide to change our ways and grow at least some of the things we eat? Our mild maritime climate offers us the opportunity to grow food year round. Yes, a garden does take time and continued dedication, watering, weeding and harvesting. Like a young child, the garden can't be left unattended. But is the luxury of being able to walk into a store and buy perfect produce really worth 10 times the price of homegrown — not to mention all the resources expended getting it to the shelf? Imagine the journey of a carrot to the plate. If the carrot comes from the home farm, the farmer goes outside, picks the carrot and eats it. Bam! This carrot has high nutrition and delicious taste and texture because the carrot was consumed within moments of it being picked. Now imagine the carrot coming from the agribusiness farm, whether organic or not. The carrot is picked, boxed, shipped, stored, placed on a shelf, purchased, brought home, maybe sits in the fridge, then gets consumed. When the carrot gets to the plate, it's already been a few days to a week or more since picking. After all that time, it has lower nutrition and a less pleasing taste and texture. Rather than spending tons of fossil fuel and millions of kilowatt hours on running cold air machines producing nutrient poor food, we could grow the highest quality food available for a lower price. We can cut out a lot of unnecessary trucks and refrigerators by just planting the carrot ourselves. The home farm doesn't have to be huge, fancy or professionally landscaped. As long as it has soil, regular water and compost, the plants we start as seeds will grow and provide us with countless meals. In addition to being environmentally friendly, home vegetable farming is pretty darn exciting. This time of year, with the planting out of the seeds and waiting for germination, thrills are at an all-time high. And later, what a feat, to simply walk outside and pick our dinner. The amount of energy and effort we put into our gardens can be hours or minutes. You can buy a few packets of seeds and mix up some home farm potting soil using the recipe below from Richo Chech's The Medicinal Herb Grower: A Guide for Cultiavting Plants that Heal, Volume 1. Throw them in an old milk container with nail holes punched in the bottoms, a paper egg carton or a toilet paper roll with one end tucked closed. Keep them moist and wait for the first sprouts to pop up. Voila, the garden is born. You can grow them to maturity in a large terra cotta pot, a wooden barrel, a raised bed or in the flat ground. Plants aren't really picky where they end up, as long as they have light, water and compost. So go ahead. Dare to try that radish patch you've been thinking about since fifth grade. We all have a little farmer inside. We've been growing food as a species for countless generations and once the process gets rolling, we can't help but become totally hooked into keeping the plants happy and feeding ourselves. Mix this up first and add it to your potting soil. Mix all the ingredients well on dry ground without grass, on a tarp or in a wheelbarrow. Loosely pack the mixture in a paper container, like a halved milk carton with holes poked in the bottom, and plant your seeds. Katie Rose McGourty is the owner of Healthy Living Everyday at www.healthy-living-everyday.com.